Double my pleasure…there’s another LTD II in town. I was pretty chuffed to find the one I wrote up last year. I called it “The Longest Mid-Sized Car Ever”. A whopping 220″; that’s longer than a whole lot of the full size cars over the decades. Now that one was an LTD II S, meaning the stripper version, and without that lovely opera window in the C pillar, like this one. I’m not quite sure what to make of my good luck. Will there be an LTD III in my future? 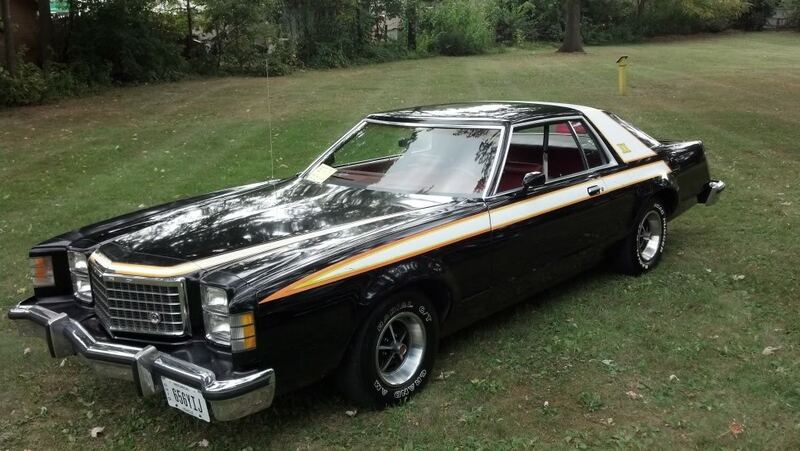 It’s a Torino… I like it. Not as much as the basket handle ‘Bird that moved in down the road,, but, hey. Love the dash layout. 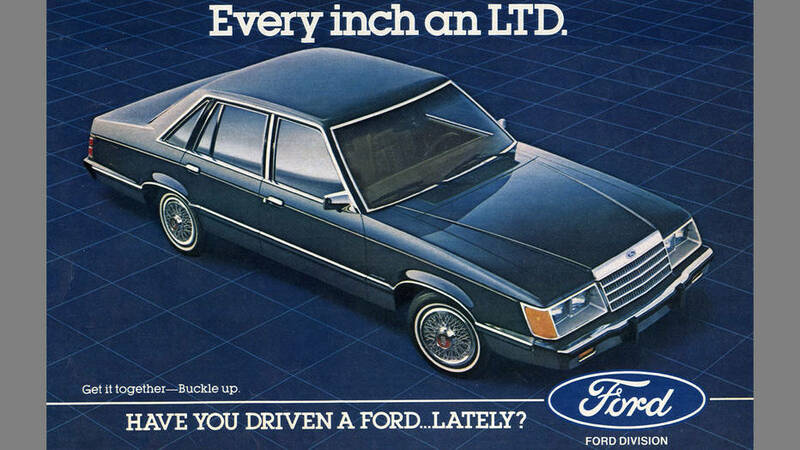 Would an LTD III be that Fairmont Futura looking thing from the early eighties? Love those base wheel covers on those LTD II(s). One of my favorite simple stampings of the era. They almost look like real rims at a glance. Yep… that’s the one. I like this custom one that was created from a Basket Handle Futura or Z7. 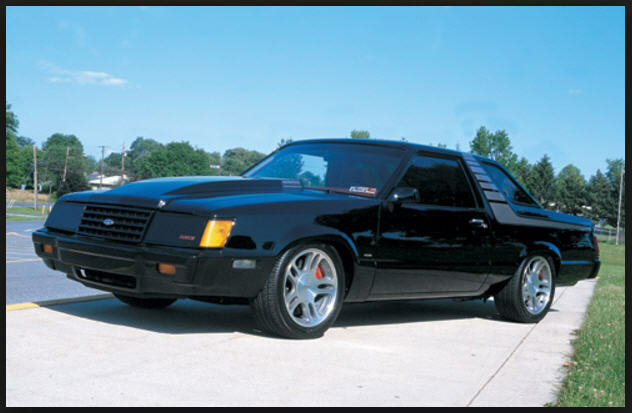 One of my Bucket List Cars/Lottery Cars would be to take a non-Mustang, non-Capri Fox platform car and throw as many Mustang parts at it as I could. The dorkier the better. Make it a non-Grand Fox Body Marquis wagon with di-noc. I never get tired of seeing this LTD-mont-stang. I do like the fox-platform LTD. I had an ’83 wagon with the 3.8L. It was a good car, drove smooth and had surprisingly decent torque. It was simple to work on, as I changed the front wheel bearings (my first time) and it was easy and cheap. 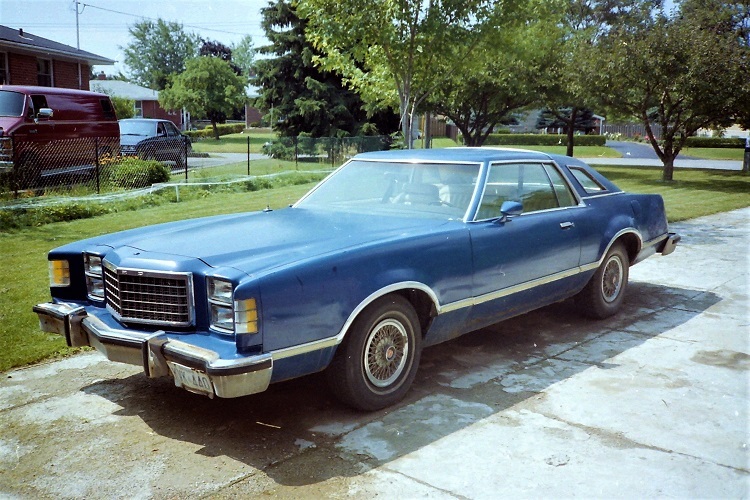 I had an 86 Marquis (Marquis II?) wagon. With its 3.8 and C5 3 speed auto I liked the way it drove better than the 85 Crown Vic that replaced it. Was there ever a more blatant tail end ripoff than this one? I know that none of the parts interchange with a 76-77 Buick Century/Regal coupe, but I kind of want to try a test-fit just to be sure. I wonder if it was possible to get the C pillar without the opera window in tandem with the high-end trim options. Yes it was big and fat but I actually like the LTD II sedans better than the pre-1977 Gran Torino sedan. And the Cougar sedan that lacks those over/under headlights is the best of the bunch. If it was a copy, it was a poor one. I think the Buick look alright. The emphasis was on the horizontal tail lamp, not the verticals. 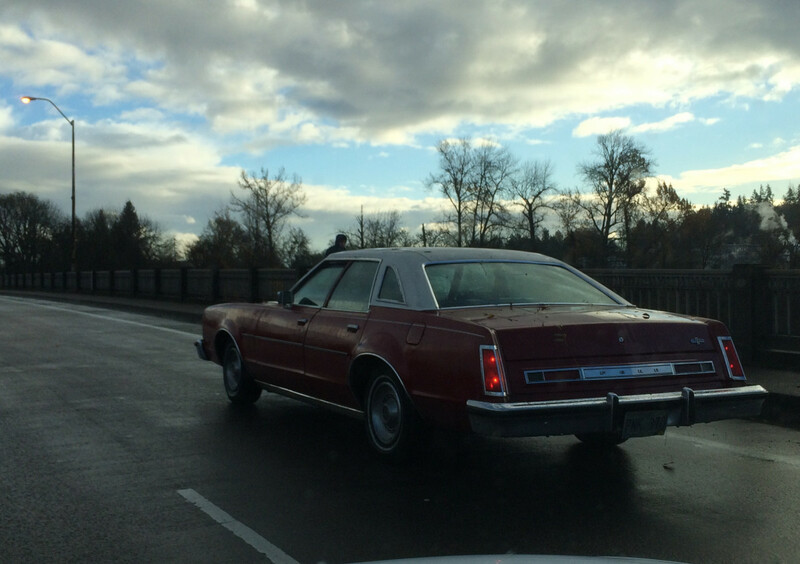 Also, the Buick melded better into the 2-door colonnade body. We had several of both in Long Island in 1978, though not nearly as many as the colonnade Mailbus, Cutlasses, Monte Carlos, and even Grand Prixs. Many of the Buick coupes were cheaper V6s. Chrysler did a better job of copying the colonnades when they launched the Cordoba in 1975 which pretty much aped the 1973 Monte Carlo. Believe it or not this is the LTD II’s most flattering angle. Another understated fine Ford. Hood was a bit too short, though. Did any ’70s car in the early ’80s get dated more quickly than these? 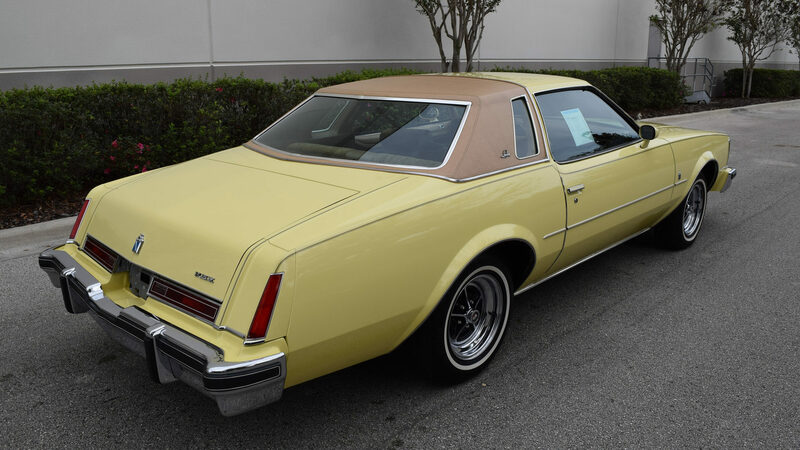 Maybe it’s the contrast with its’ Mercury Cougar variant that seems almost a full generation newer due to not having the stopgap stacked-square headlights, and the fact that Ford all but reused its’ face for the Panther Town Car. You can’t help but feel a sense of satisfaction when you see a 40 year old car still driving even on a rainy day, all the taillight bulbs working, the vinyl roof appearing to be sufficiently intact. Yes someone has taken, or is taking good care of this car. I’m not a fan of these, but it’s good to see a rolling artifact from our not too distant past. All 220 inches of her. To me these are some of the most blah cars ever made. They are morbidly malaise-y. Still, gotta give props to the owner who has kept it in good shape. So it can be a warning from history. I’m imagining it with that opera window enlarged, the lower edge of it carried down to line up with the other side windows, to make it a proper six window sedan. Lower the trunk line to that level and square up the rear, chop off a foot or so of front overhang. There’s potential there. I was always amazed at how a car SO big on the outside could be SO small on the inside. The ugly 5-mph bumpers kill what otherwise could be a good looking car. Take a trip ‘down under’ and bring back an LTD Landau, or an LTD Town Car. Australia never got stuck with those insane bumper and emission rules that saddled everything sold in the US in that era. I always thought the Sport Appearance Package versions were really cool, though I’ve never actually seen one in the wild–only in ads or showroom brochures. They must have been rare even when new. I think this one in the black scheme looks the best.